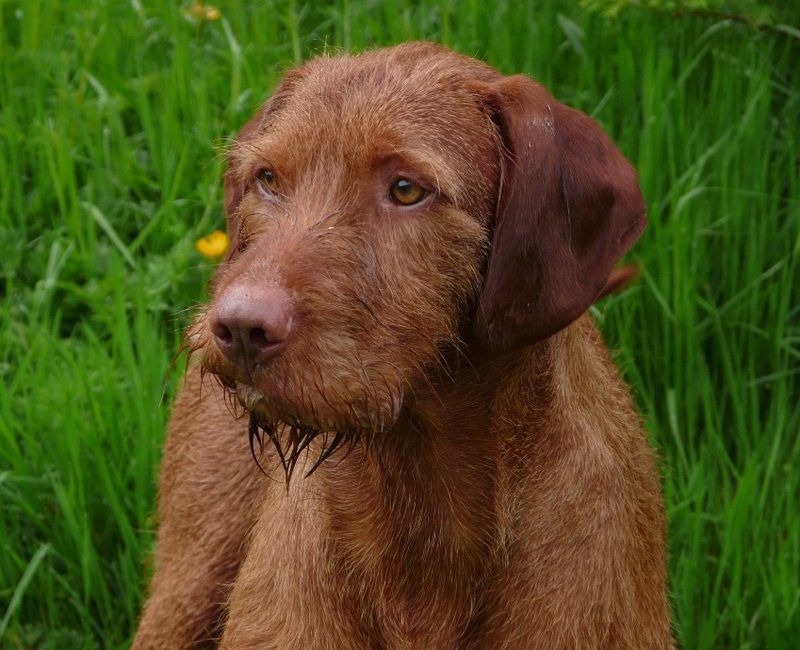 Mingus | Belatarr Hungarian Wirehaired Vizsla. 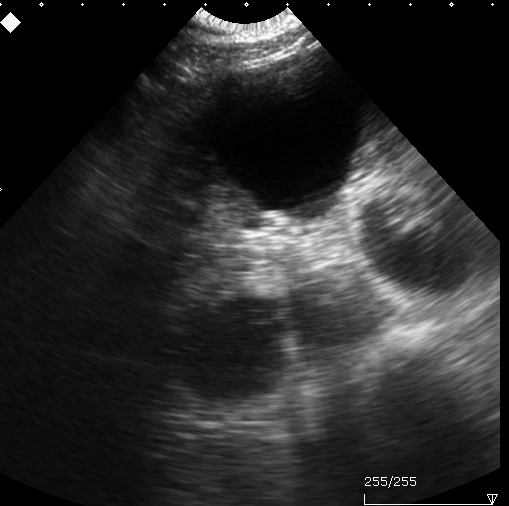 Tuesday saw the arrival of our excitedly anticipated new generation of Belatarr babies as, right on schedule, Phoenix and Mingus’ second dozen were born. 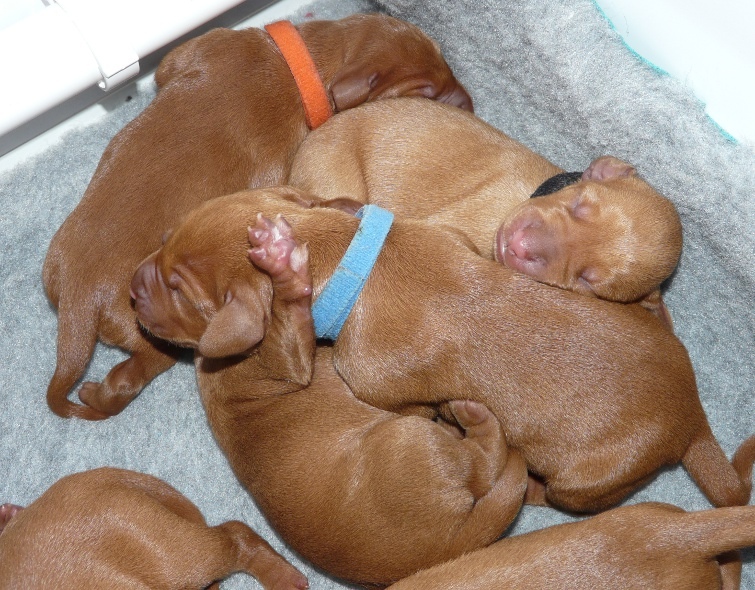 Miss Orange was the first to arrive, at a very respectable 10:53AM, with 10 of her brothers and sisters duly following in quick succession and puppy number 11, Miss Lime, making her appearance at 15:15 that afternoon. Miss Lime & Miss Orange. 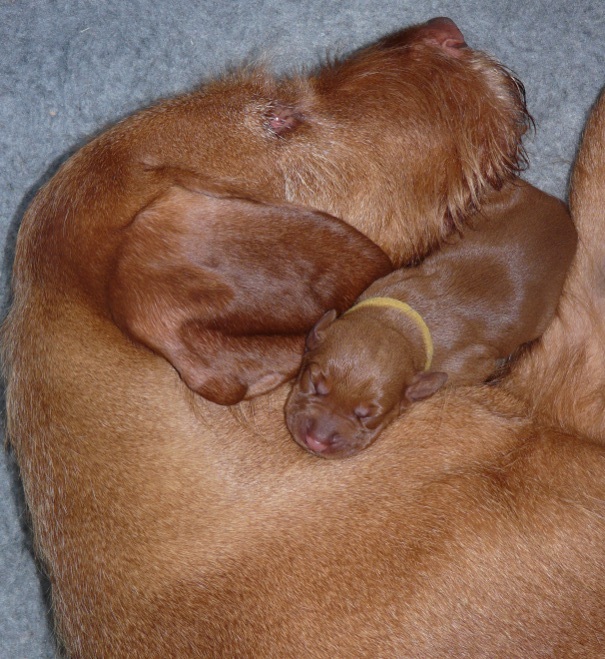 All of the births had been very quick and very easy, with just one or two contractions and then a new arrival. So far so good. 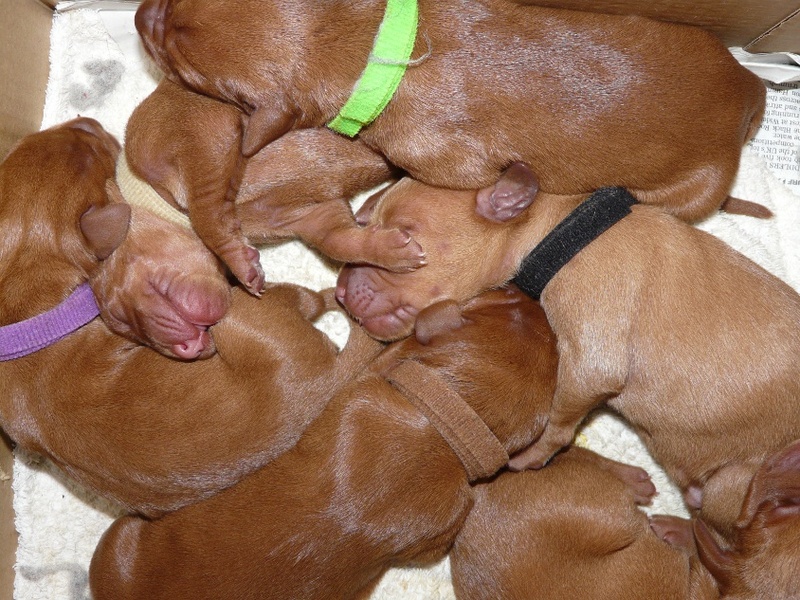 However, after puppy number 11 things ground to a halt, although it was very evident that at least one more pup was still waiting to arrive. After a few hours of waiting and no signs of any further action we all decamped to the vets (11 puppies included) where two shots of oxytocin, a 15 min IV drip of liquid calcium, a vigorous walk up and down the road and 5 hours later puppy number 12, Miss Fawn, finally decided to put in an apperance, arriving (in the car boot) fashionably late to the party, but (despite our fears over the worryingly long wait) very fit, healthy and at a good weight. Mr Red takes centre stage. Now, some 48 hrs later, all 12 babies – 7 girls and 5 boys – are feeding very well and all are gaining weight at almost identical rates. 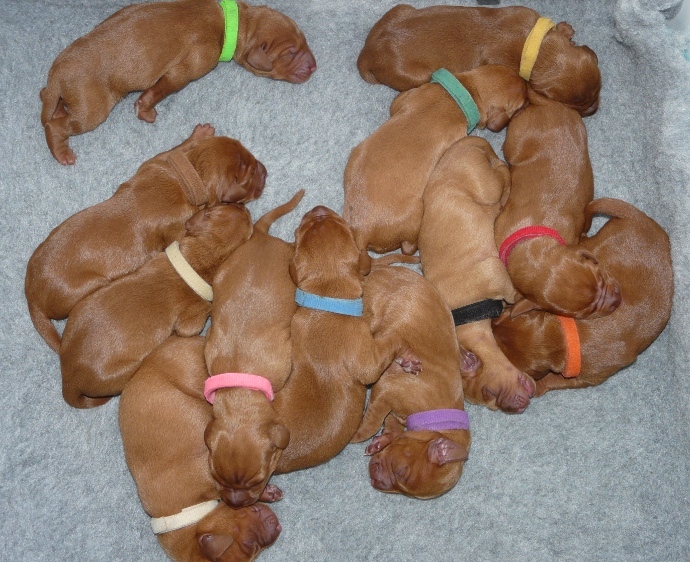 As with Phoenix’ first litter there are no tiddlers or weaklings amongst the bunch and all twelve are vigorous indeed! 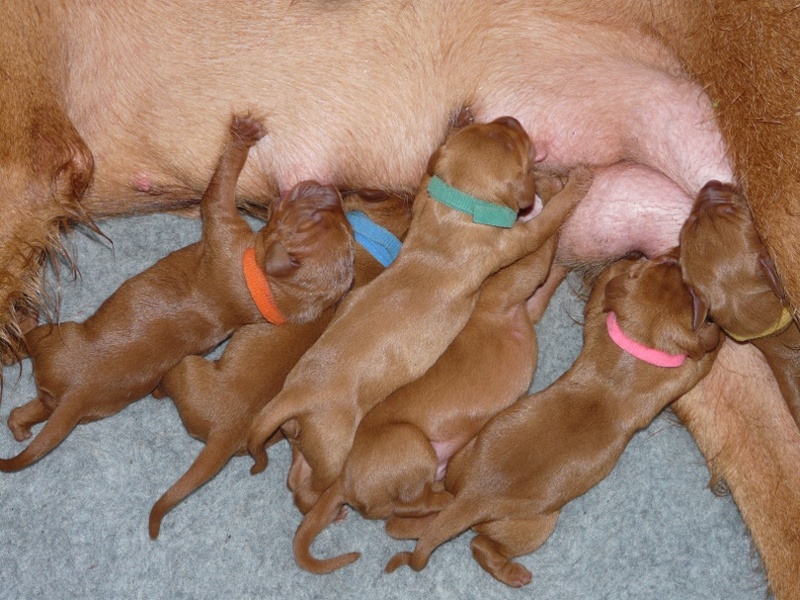 With mum having only 6 functional feeding stations we have, as before, divided the pups into two teams and feed them one team at a time, every two hours, night and day to ensure that everyone gets their share. Team 1 take their turn. Whilst team 2 wait to be called into action. Phoenix herself has been a wonderfully attentive mother, as ever, but today she surprised us by deciding that she wanted to go out with the boys for a swim in the river and a quick hurtle around the land before thinking that she really should zip back up the hill to return to her offspring. 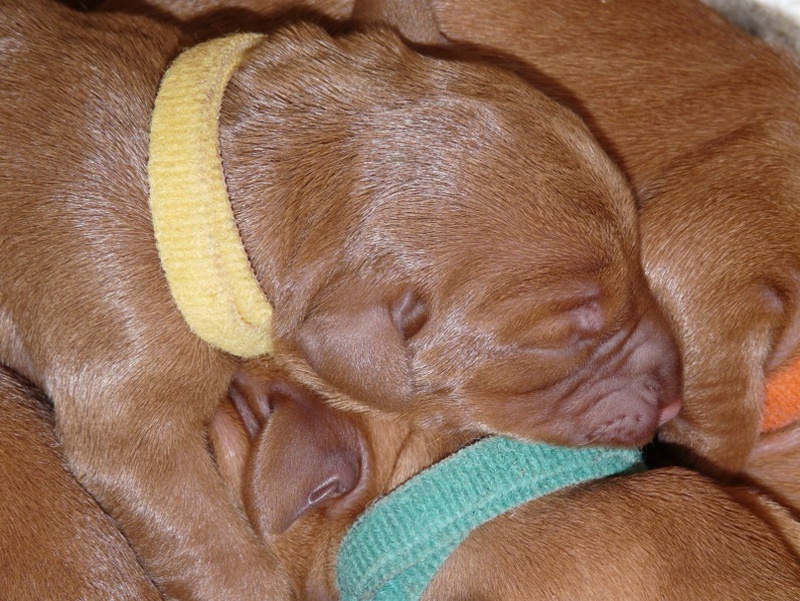 Mum forms a comfy resting spot for Miss Yellow. That’s the story so far.. .more pics follow below and watch this space for ongoing puppy antics and the ever-popular weekly puppy portraits too! Mr Black and Mr Green. Mr Blue hangs out his teeny-tiny ears. 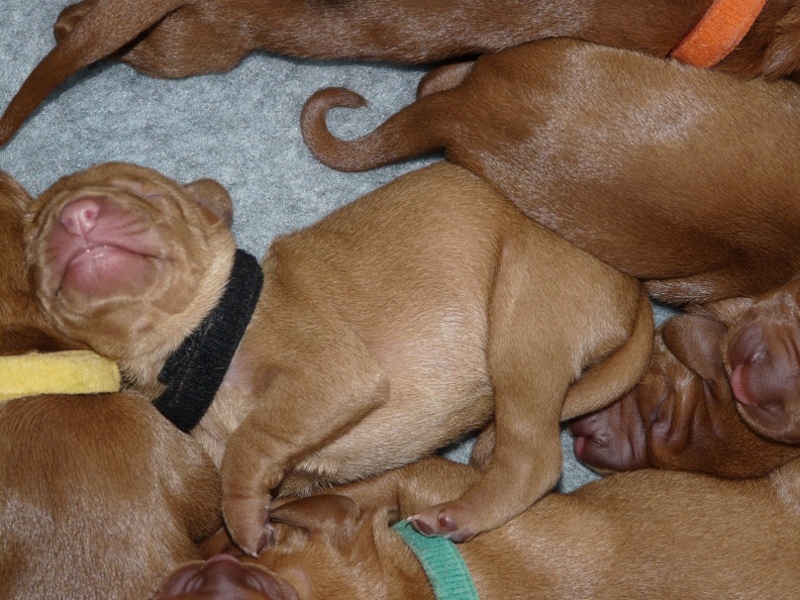 Mr Black, on the other hand, is the palest of the pups. …and a good contortionist too! 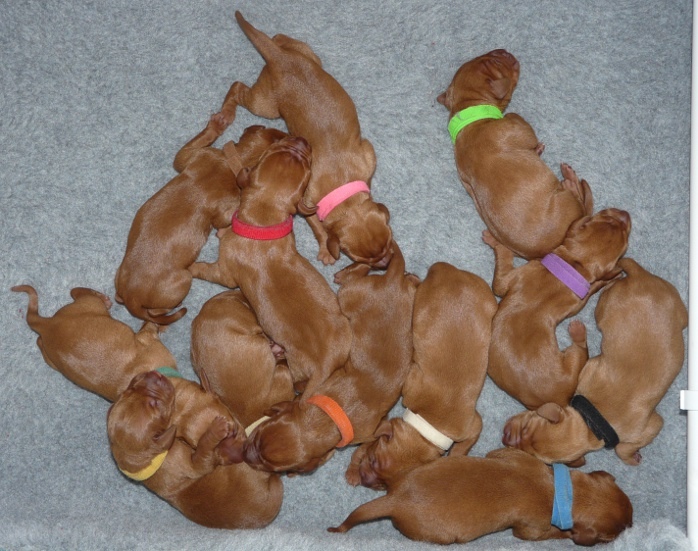 We have been absolutely delighted with the uniformly healthy, sound, happy and high quality pups from our 2011 litter and have been fortunate to be able to watch many of them regularly and at close hand as they have grown into the superb young dogs that they are today. 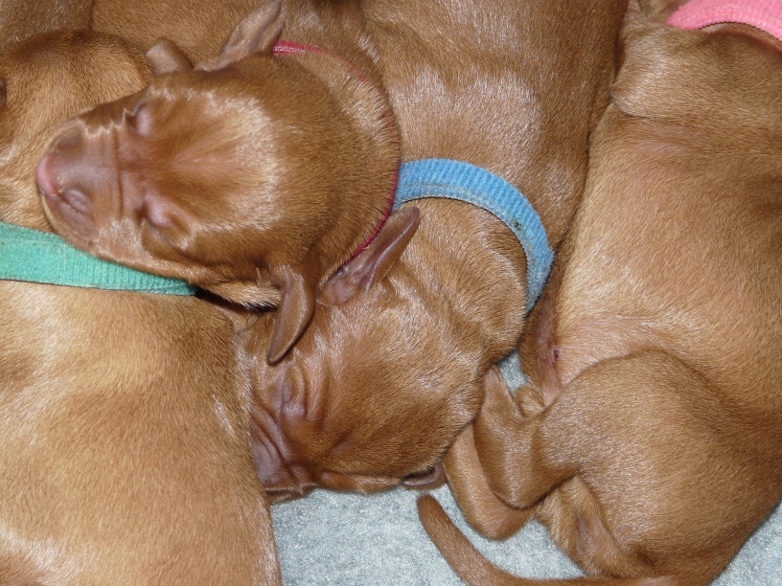 Four of the pups from that litter have gone on to have great success in the show ring and several others of their brothers and sisters could undoubtedly have followed suit, so it was an easy decision to undertake a repeat mating, using Mingus as sire, when Phoenix was ready for her second litter. After an initial mild panic when the progesterone testing lab that we were using had their machinery break down, resulting in a 3 day delay in getting Phoenix’ blood test results back (urghhhh!) 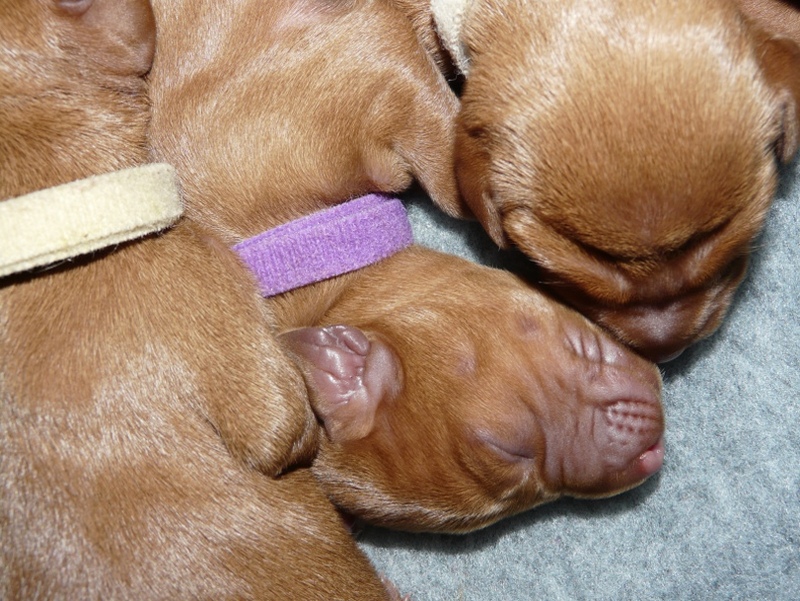 we achieved 3 very easy matings, all with excellent ties, commencing on the same day in Phoenix’ season that her previous litter was conceived. 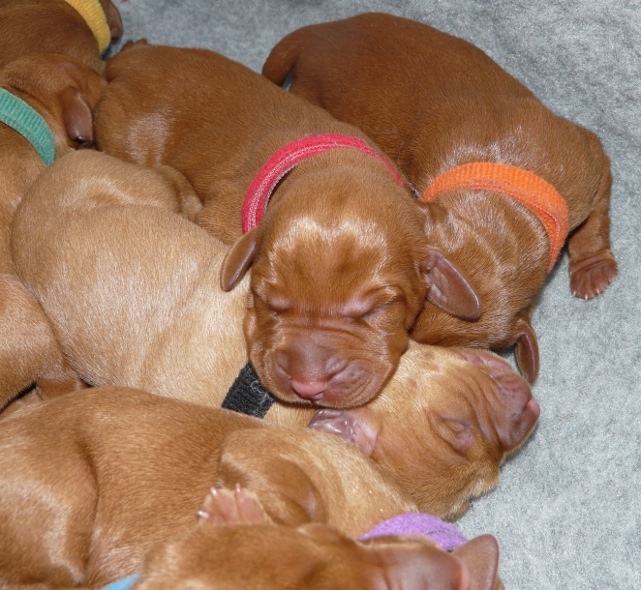 Phoenix’ due date is 23rd/24th July and we are now able to take enquiries from show, pet and working homes, about this forthcoming litter. 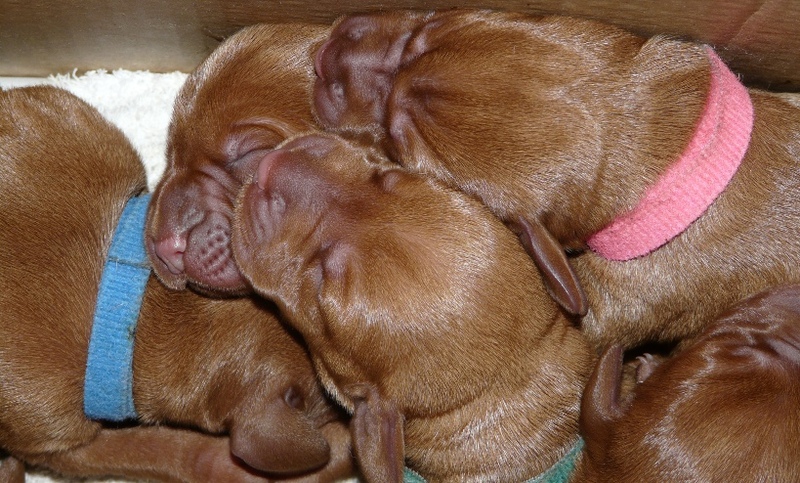 All puppy homes will be carefully selected to provide the best possible start in life for this next generation of Belatarr HWV’s. If you would like to be considered for inclusion on our puppy list or would like to discuss Belatarr dogs and life with this wonderful breed in more detail then please do contact Tim directly at: renfromail@aol.com. 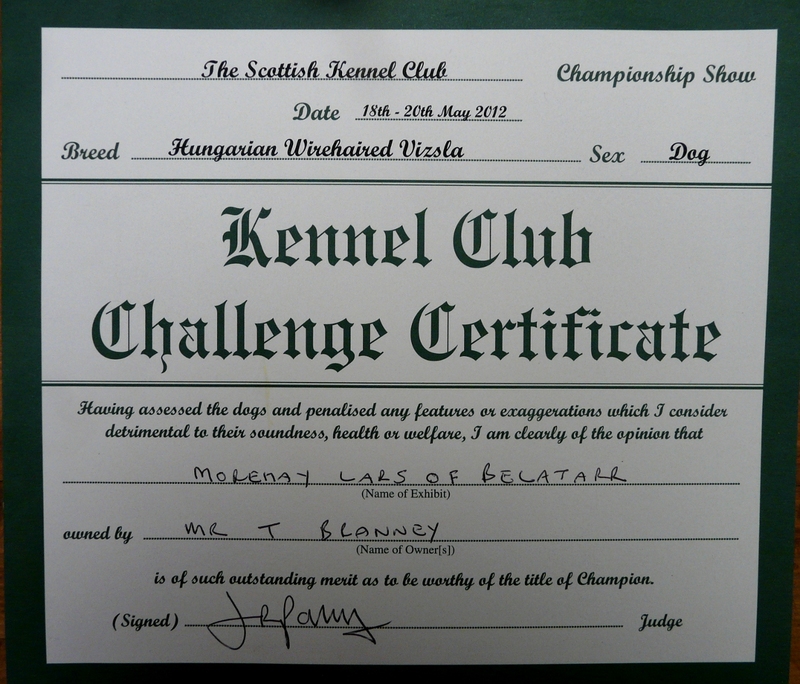 2012 has been quite a landmark year for us here at Belatarr – Mingus gained his first CC in May and then managed to break his toe just hours before the Welsh Kennel Club Championship, resulting in a long and worry-some convalescence which was only completed at the end of October. 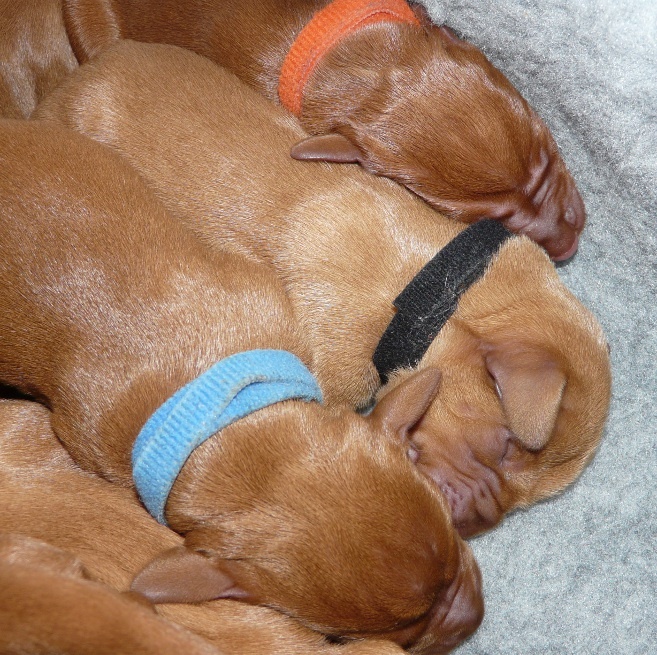 The family together – Left to right – Milo, Django, Mingus & Phoenix. 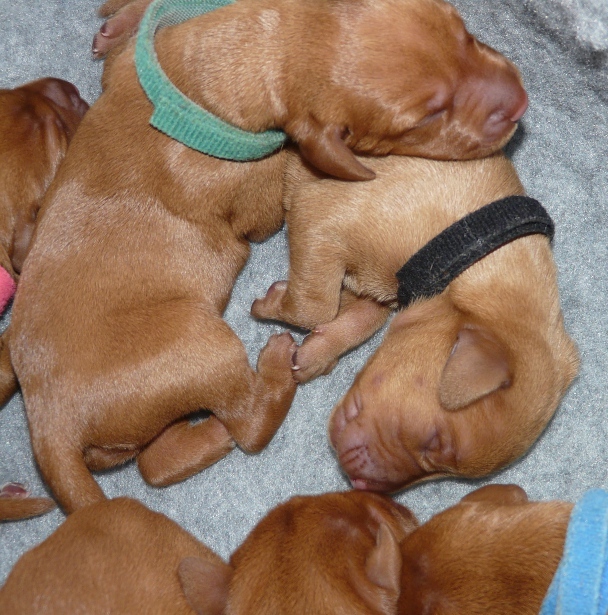 Meanwhile our young pups have gone out and made their way in the world. 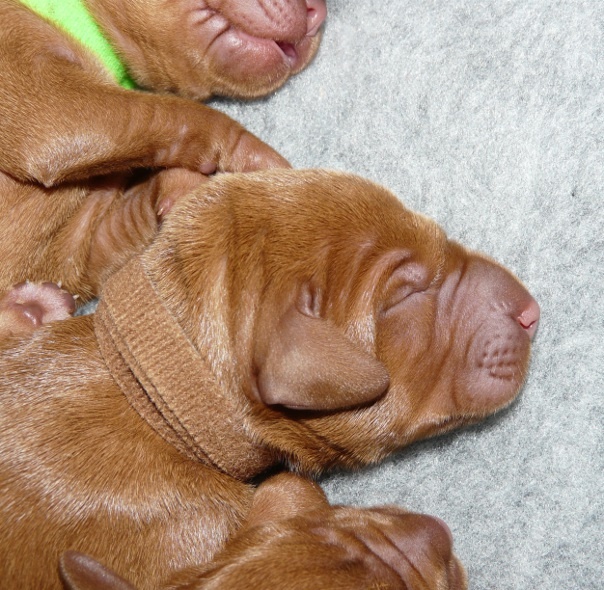 Thanks to the sterling efforts of David & Jenny (with Charlie Parker) and Irene (with double-funster twins Billie & Gryphon) all four of the Belatarr show-pups qualified for Crufts, and all had significant wins at both Open and Champ Show level through the year. Charlie & Jenny in action. This great result proved to be just the start of a roll for Charlie, however. Just a few weeks later, at the Huntingdonshire Canine Society Open, he won 1st Junior AVNSC and then took best AVNSC, beating several top adult HWV’s, including one recent HWVA Best in Show winner along the way…not content with that victory he then went on to take Gundog Group 1, a phenomenal day, especially given that 12-month-old Charlie & his handler Jenny had never even been to a dog show just a few months earlier! The show year finished on another high as Billie (Belatarr Mahalia Jackson) took 1st Open & Best of Breed under Gavin Robertson at Yeovil & District Open on 3oth Dec. On the very same day Charlie was back in action too, this time at the two-day Luton Canine Association Premier Show, where he was 1st Junior HWV and went on to take another Best of Breed, beating a large entry including the years’ top-scoring HWV puppy (now also in Junior) as well as the Open & Post-Grad HWV winners along the way. Fabulous work! In Mid-November Django and sister Ruby (Belatarr Nina Simone) trekked over to Hampshire in order to be hip-scored. 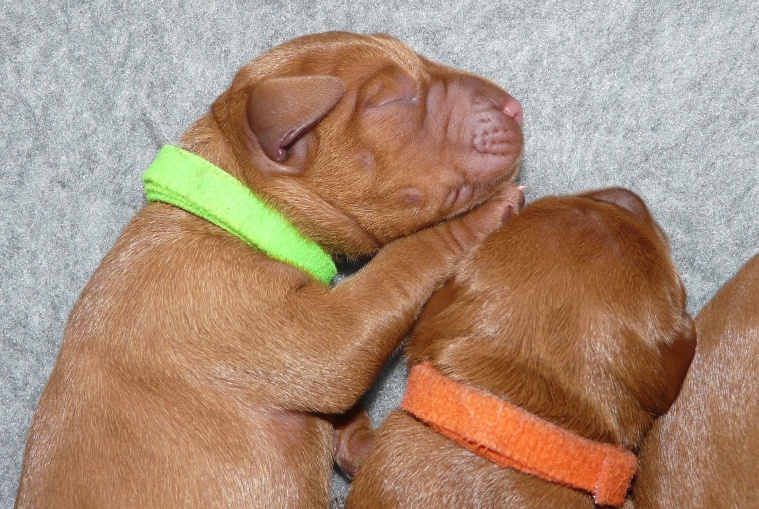 Their results came back a few weeks later and exactly matched each of their parents – 5/5 for Django, the same as Phoenix, and 4/3 for Ruby, the same as Mingus. 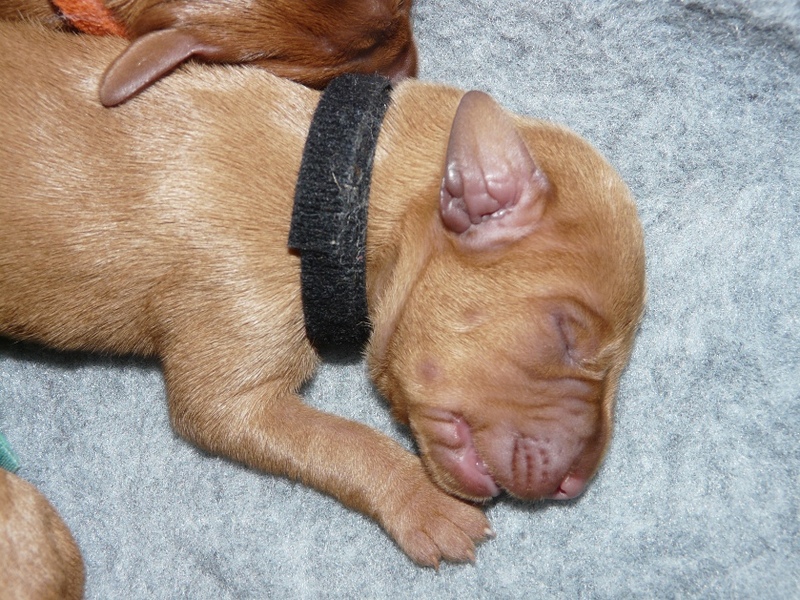 Django has had a pretty full-on and energetic puppyhood, which has perhaps resulted in a little additional wear & tear, but both scores are pleasingly under the breed average and represent the final test for the success of this litter. 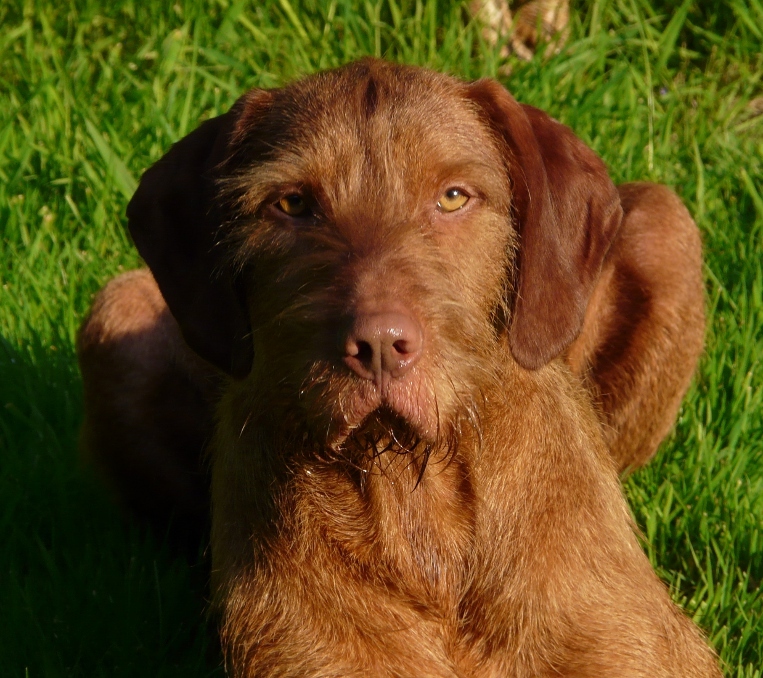 A quick mention too of the Hungarian Wirehaired Viszla Club of Great Britain Breed Specific Seminar that Tim attended. Scheduled for the day after the Midland Counties Champ Show, and presided over by Crufts judge Lindsey Townsend, this proved to be a really excellent, well-organised and highly enjoyable day which attracted a very large attendance. The afternoon was dedicated to an exam and the writing of a highly detailed set of 5 (full-A4 page) critiques, and, a week later, Tim was delighted to learn that he had successfully passed the Seminar, nicely in time for his first confirmed HWV judging appointment. Although it seems like only yesterday that Mingus was a little pup riding in a sling, he’s now three years old, a father of 12, of course, and a very intense fellow who takes his responsibilities as pack leader very seriously. When out-and-about Mingus is always scouting ahead with his head in the air, alert for possible dangers (and/or opportunities) whilst everyone else romps around having fun with sticks etc. Back at home Mingus remains incredibly affectionate as well as the most wonderfully co-operative and biddable dog we’ve ever had, whilst his beautiful coat and head command everyone’s attention wherever he goes – every day living with him is a absolute joy and privilege. This last weekend saw Tim & crew set off on the 950-mile round trip to the Scottish Kennel Club Championship Show at the Royal Highland Showground on the outskirts of Edinburgh. Mingus was up against the big boys in his first Champ Show Open class, presided over by breed expert Jonathan Parry. Despite being the youngest in the class Mingus well-and-truly rose to the occasion, driving round the ring in great style, and we were absolutely thrilled when he was awarded 1st Open Dog – beating the Crufts 2012 Best of Breed, along with the only UK male Champion HWV plus the only male currently with 2 CC’s in the process. The CC means that Mingus is granted a Kennel Club Stud Book Number and an entry in the revered Stud Book, which in turn means that he is also now qualified for Crufts for life and is one third of the way to becoming a champion, and all at just 2 years of age! We were delighted that his breeder Jacqui could also be at the show (en route to a working test with Mingus’ sister Love) to witness her baby all grown-up and hitting the big time in the show ring! We’re just so very proud of our beautiful boy. Mingus back on home ground – wet and muddy in the garden. A little later in the show Phoenix (who had most definitely never looked better – motherhood certainly becomes her!) also put in a great performance and qualified for Crufts 2013 at her first Champ Show for nearly a year, and also her first since her humongous litter of 12. …and speaking of the Belatarr Twelve, Charlie Parker was the first of the baby boys to take to the ring, and went straight in at the deep end earlier in the month at the National Championship Show, where he thrilled Tim and also attracted a lot of other attention ring-side with his ultra-stylish and ultra-sound movement, not to mention his super-affectionate personality and beautiful head. Owners David & Jenny’s hard work and dedication certainly paid off when Charlie also qualified for Crufts at his (and their) very first show – cue excited squeals all round! Charlie took the whole thing in his stride and proved that he’s definitely made for the ring…his journey is only just beginning!